Leading economies of the world, like the U.S., Japan, and Germany, suffered contraction of economic activity (in other words, recession) in 2008 and 2009. However, emerging economies, like India and China, saw only a slowdown in economic growth. The fall in economic activity across the world brought enormous economic hardship for people, especially for those living on the margins. For example, in India, slowdown in economic activity and high inflation has, over the last three years, pushed one more than one crore (ten million) households below the poverty line. Did the economic turbulence affect the wealthy also? No, if you go by the infographic above. 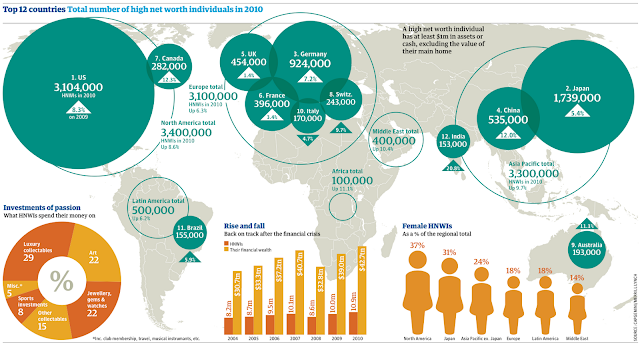 According to the annual world wealth report by Merrill Lynch and Capgemini, the wealth of HNWIs around the world reached U.S.$42.7 trillion in 2010, rising nearly 10% in a year and surpassing the peak of U.S.$40.7 trillion reached in 2007, even as austerity budgets were implemented by many governments in the developed world. India has over 1,53,00 millionaires, a 20.8% rise from previous figure, making it the country with the 12th largest number of the super-wealthy. So the world's richer are getting richer by the day. I know Anil Ambani will beg to differ with me!